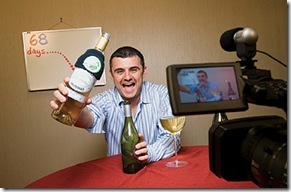 A few days ago, a video from the always-entertaining Gary Vaynerchuk caught my eye. The video is of a talk Vaynerchuk gave back in October at The Booksmith, a San Francisco bookshop. The entire hour-long talk is worth watching, but the first twenty minutes are enough to get the point across. Never under-estimate the pace of change. Vaynerchuk points out that the companies and websites that have enabled his success (Facebook, Twitter, Viddler, etc.) did not even exist a few years ago. We are still at the very beginning of a massive change in what media means and how it gets produced and consumed. Vaynerchuk reminds us that this is a very exciting time and that we’re privileged to live in it – but the pace of change is relentless. It’s not about being Oprah. Vaynerchuk reminds us that – because of the way media is changing – the media game is no longer about being Oprah. Even today, small publishers and video producers who focus on a niche audience are able to earn a very respectable living by providing value to that niche. This is something that was pretty much unthinkable before the internet. And this is all happening before online advertising has really figured out how to monetize audiences efficiently. When that happens, the cottage industry of online media will grow even faster. To succeed in digital media, you don’t need to be as big as Oprah. Technology doesn’t care about us. Vaynerchuk describes a conversation with an old-media executive who complained that is wasn’t “fair” that social media and online marketing was destroying his business. The truth is – technology has a mind of its own and it doesn’t care about whether or not certain executives will have jobs or not. People are spending more time online and less time consuming traditional linear TV or printed media. People are walking around with their eyes on their iPhone/Blackberries and less on out-of-home advertising. As our attention migrates, ad dollars will migrate as well – and there are billions and billions of ad dollars at stake. Real businesses. Vaynerchuk started out as a guy with a wine store who figured out how to leverage social media to drive his brand and his company’s sales. Some of my best friends are social media consultants – but social media is not really about social media consulting and its not even about technology companies. The big revolution – the really interesting one – is that regular bricks-and-mortar business are beginning to realize that they can leverage social media. The even bigger revolution is that the tools needed to do this are getting so easy to use that these businesses are increasingly doing this on their own. With Vaynerchuk’s talk fresh in my mind, I noticed this outstanding piece by Paul Bonanos at GigaOM. Paul covers a discussion of venture funding for online music companies at the SF MusicTech Summit which took place on Monday. While there have been some exits in the online music space (Israeli company FoxyTunes which was bought by Yahoo and the stunning $280M acquisition of Last.FM by CBS), the sense on the panel was that the digital music space has become a pretty tough place recently. Recent exits of Imeem, iLike, and Lala has not generated the spectacular returns hoped for by VCs and VCs are apparently increasingly skeptical that the space will generate great returns. Why is this and what is the connection between online music start-ups and Gary Vaynerchuk? I think there is a connection. Vaynerchuk is talking about a world in which digital distribution costs are approaching zero – a world in which content is truly king. As distribution costs go down, friction is taken out of the system. Vaynerchuk doesn’t depend on editors or content programmers or distributors or networks to get his content out. He does it himself – efficiently and effectively and the content goes where it needs to go because it gets pulled by the users that want it. Vaynerchuk’s costs are low so he doesn’t really care how many people watch and given episode of Wine Library TV. The more the merrier – but there is little financial risk involved. In the world of online music – content is also king and always will be. I now regularly access music from at least four different providers (Rhapsody, iTunes, Grooveshark, and YouTube). What interests me is the music itself – the song or video I want. The distribution of that content – however – is pretty much a commodity. As much as I love GrooveShark, I’m not sure it’s a company that can grow to tremendous scale because there is very little if anything that Grooveshark does for me that any other music service doesn’t do. They all offer sharing, they all offer radios, they all have great search and playlist management, etc. Unless these online music players can come up with a way to generate truly unique value from their user base – I think their opportunity might be capped. Market frictions are a distribution company’s friend. The TV market still has enough friction in it (connectivity, UI issues, programming guides, search, lack of a widget platform, etc.) that companies like Boxee and Roku may be able to create tremendous value by simplifying things for users and building a loyal user base. Online music, however, seems to have reached a point where access is so convenient and pervasive that its hard to build a distribution-based business. The real winners in this new world of near-zero digital distribution costs are content owners (U2, Radiohead, and Gary Vaynerchuk) because they own the rights to the product of their own unique creative efforts – and that is ultimately good news. Posted by gdibner on Wednesday, December 9, 2009, at 6:09 am. Filed under Internet, Marketing, Music, Online Advertising, Technology, Venture Capital, Video. Tagged Boxee, foxytunes, Gary Vaynerchuk, Internet, online music. Follow any responses to this post with its comments RSS feed. Both comments and trackbacks are currently closed. Good piece, Gil. I would add that whether we are talking about audio or video, it is clear that audiences love great content. What is less clear is the business model. I would argue that video and music content owners can offset declining sales of silver discs (DVD, Blu-Ray, etc) by transitioning from a “control” model to one of “access”. For example, at $.10 per song, wouldn’t you be willing to pay $5 for 50 songs? Just as Skype ($500 million revenue) and LinkedIn ($120 revenue) have triumphed through Freemium business models, I would argue that consumers will also be willing to pay a premium for content once they have been permitted to”taste the soup”. I am also certain that the music business does not have the DNA to transform itself in this way. Long live great music…with or without the labels. Connect with me on Linkedin, Twitter, Facebook, or e-mail.